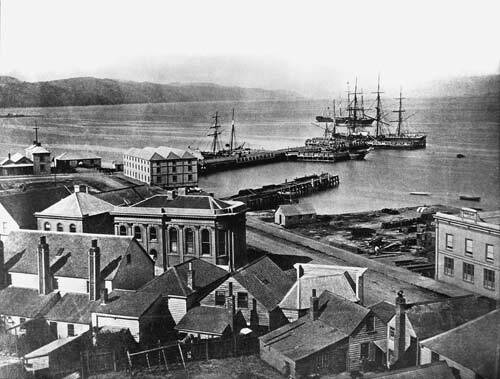 This 1874 photograph captures Wellington’s emerging financial district. The Wellington branch of the Bank of New Zealand is the large building at centre-left. On the harbour side, across Customhouse Quay, are Plimmer’s and Queen’s wharves. The three-storey, triple-roofed building at Queen’s wharf is a bond store. Wellington’s customhouse and post office are on the other side. This layout highlights the strong relationship between money, trade and communications in mercantile cities.